A top-tier vacation getaway awaits you in Villa Viman, located on the seaside in Phuket Island. This highly luxurious and spacious 1,280 sqm villa is perfect for accommodating large groups of travelers who enjoy fine pleasures and utmost comfort. Every single space of this three-level travel home is carefully designed to give guests’ a one-of-a-kind stay. Decorated with plush and contemporary furnishings inspired by Asian culture, Villa Viman will produce the perfect exotic escape. The master bedroom and five guest rooms each come with a beautiful ensuite bathroom. Various suite configurations include unique features, such as ocean view, balcony, flat-screen TV, day bed, walk-in closet, work desk, playroom, outdoor bathtub, and many more. Villa Viman’s ample variety of luxury bedroom types allows guests to feel thoroughly pampered and merely focus on enjoying every moment. Villa Viman’s numerous list of amenities makes it a truly unique stay in Phuket Island. With the entire ocean-facing side of the villa covered with floor-to-ceiling windows, any time spent inside will feel like a dream. Have a social gathering by the gorgeous living room, or take the party to the sophisticated dining room and have a tasty Thai meal prepared by the villa chef, all while admiring the view of the ocean. Villa Viman also comes with a home office with desktop, minibar, media room with home theatre system and indoor sports such as foosball and ping pong tables. Whether you feel like spending a toned-down or fun-filled day at the villa, you will have the freedom of options to fit your mood. Villa Viman’s outer area is just as magical, including a highly attractive infinity pool, jacuzzi, alfresco dining area, elegant sun deck with sunbeds and elevated open pavilion by the pool. The majestic nature and ocean view will have you thinking you suddenly left civilization and entered paradise. Just resting on the edge of Villa Viman, the infinity pool creates an illusion of never-ending joy as it empties into the Andaman Sea. Imagine immersing yourself in its calming waters after a busy day and allowing the glorious sunset to take your body away. Luxurious and colorful seating under the open pavilion makes for an ideal spot to lounge around after a satisfying meal on the alfresco dining area. Enjoy the panoramic views while you sip on some delicious cocktails with good company. Villa Viman also comes with three staff who will assist with anything you may need or desire, so that you may have the highest quality travel experience. It has high-speed internet throughout and covered parking for two cars. 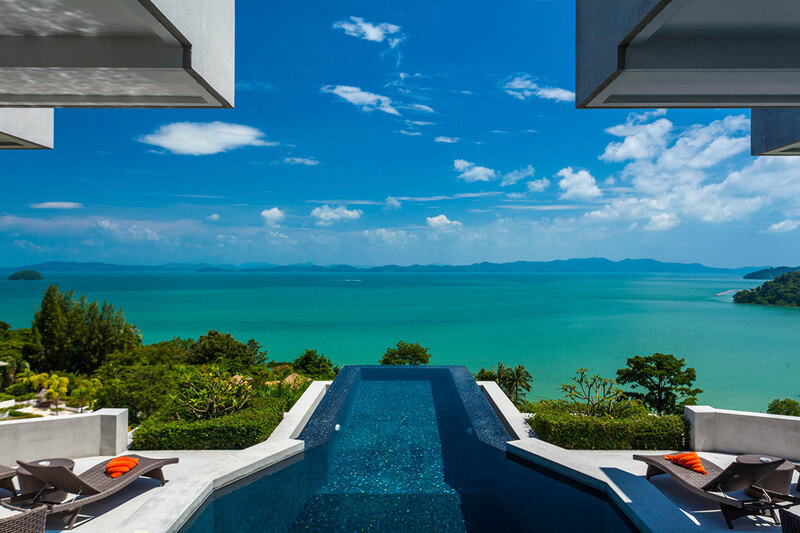 Product Description: A top-tier vacation getaway awaits you in Villa Viman, located on the seaside in Phuket Island. This highly luxurious and spacious 1,280 sqm villa is perfect for accommodating large groups of travelers who enjoy fine pleasures and utmost comfort. Send an inquiry about Villa Viman, Phuket.